A nest of an Indian Harvester Ant, approximately 30 km North-West of Pune, Maharashtra, India. Image by “Rushil”, shared under a CC BY-SA 3.0 license. On the Indian subcontinent there is a species of ant with a distinct nest entrance flanked by a raised series of concentric clay rings, as though to prevent flooding. 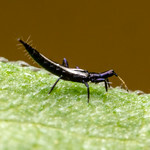 The ant seems reasonably common- at least, it is commonly photographed (see here). Locals call it a “harvester ant”. I have not seen any photographs where the ants are visible enough to identify. The internet has two different ideas about the identity of this mystery mini-architect. One is Pheidole sykesii, which is possible, but I fear that idea may be one of those self-reinforcing internet citation circles with no verified literature behind it. The other is that this is a species of Trichomyrmex, a suggestion on twitter from several others, including at least one professional myrmecologist. My Google-Fu has run dry, though. Do any of you know what makes these lovely mounds? ***Updates from facebook: Himender Bharti, an Indian myrmecologist, is sending students out to collect specimens. And Marek Boroweic points out older literature references to Pheidole sykesii. Have you asked Christian Peeters? This seems like a good question for him. Additionally, this particular structure is frequently used by the Biomimicry people as a proven example of flood/rain resistance architecture, and some Indian companies have patterned their architecture after it. However, I can’t imagine that anyone has actually studied these ants in detail given that their name alone is so elusive (at least in the western world). It also seems strange that other patterns have not popped up in too many other areas because it seems like a minor phenotypic perturbation to start forming such structures. So there is definitely a vacuum here for some solid research… Just like the building in Harare that was termite inspired but later shown (through solid science by Scott Turner) to have nothing to do with termites (albeit being a good man-made design), concluding on function is not so simple. The Biomimicry people strongly believe that all designs must strictly mimic nature, and so you would think they’d be more careful about these things. I find it a little odd that none of the photos show any ants. Ant nest openings usually seems to have a stream of ants coming and going. The quality of the structure looks more like the work of termites. Yeah, Chris Murrow made a similar comment on facebook. But, in Ajay Narendra’s “On A Trail With Ants” book from about 10 years ago, he shows a nest and attributes it to “Pheidole”. The picture is indeed an ants nest. The first one I stumbled on I also assumed to be termite, but after careful study, was surprised to see small black ants going in and out. They are quite small and easy to miss. I’ve only seen them in Maharashtra, not in my native Mysore region. Alex, it reminds me of the crayfish mounds we find here in Florida. Ours are much smaller, of course. There are some images of nest entrances within that article. Although the funnels do look similar, they don’t have the concentric additional structures surrounding the entrance. Thanks for doing the extra footwork on this, Ted. I’m anxious to see what Himender’s group turns up. I found Wroughton’s notes Pheidole sykesii. They are in: Wroughton, R. C. 1892. Our ants. Part II. Journal of the Bombay Natural History Society 7:175-203. I have never come across P. sykesi or such an elaborate nest – this nest architecture is really impressive. Close to Mumbai, I have seen Pheidole wroughtonii build a slightly ’less-sophisticated’ fort-like nest entrance (p14 in the Indian ant book). They definitely had fewer of the concentric rings and the central tube was not as well defined as it is in the picture above. Strangely enough, these do not get a mention in Bingham’s treatise. So is Pheidole sykesi the consensus? It is amazing that the nest is so common, at least in Western India (Maharashtra) but the ant species itself has very little online information available. I doubt if this is ant’s nest. And I seriously do not think ants can ever (no matter which part of the world they’re from) build clay nests. 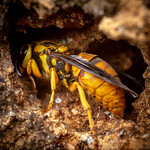 At the max, they can reside in clay nests built by other insects. Its very much an ant nest. I will supply elaborate images etc. If any one is interested to look it up. These ants collect grass seeds from the forest and store it within their nest. Just some distance away from the nest entrance they dump all the husk from the seeds at one place. So every nest we see in the forest has got its individual husk dump nearby. Very common they are here in the forests. This is very much an ant’s nest, and I have seen the ants around it several times. They dump the husk of the seeds around the nest. Considering that Maharashtra has such heavy rains, this architecture really helps in keeping the water out, and most times the nest is built on a downward slope.